Bozeman Tritons Triathlon Youth Races — Children’s Triathlon! The Tritons are teaming up with the City of Bozeman Recreation Department for the annual Bozeman classic — the Children’s Triathlon! New for 2011 — the East Gallatin Recreation Area venue and youth races for ages 6-15, expanding the entry to include the 13-15 age group set. The race is July 30, 2011. For youth race registration and more details, please see the following race outline and the announcement from yesterday’s Bozeman Daily Chronicle. The Bozeman Tritons Triathlon includes the youth race, along with sprint, junior races, and the first and only long course triathlon in Montana. Race distances are available for all ages and abilities, virtually the entire family! Participate in the sprint or long course race as an individual or a team. The Club is fueling the multisport lifestyle at East Gallatin Recreation Area, Bozeman, Montana, over one fun-filled weekend on July 30, 31. 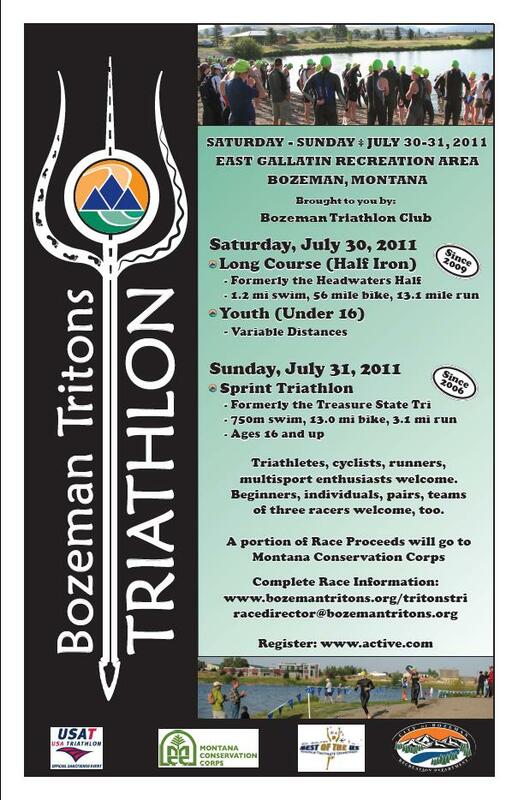 For other Bozeman Tritons Triathlon information, please visit our race website at www.bozemantritons.org/tritonstri. We hope to see you on race weekend! Long Course / Gold (ages 13 – 15) -– 200 Meter Swim / 8 Kilometer Bike / 2 Kilometer Run. A road bike is strongly encouraged. For ages 16 -19, this race is part of the Bozeman Tritons Triathlon Sprint Race on Sunday, July 31st. These athletes will have a separate wave start. Registration and information for the Junior Race is available at www.bozemantritons.org/tritonstri. A road bike is strongly encouraged.